The grand collection of sweets and snacks includes many of our most popular goodies in the village. 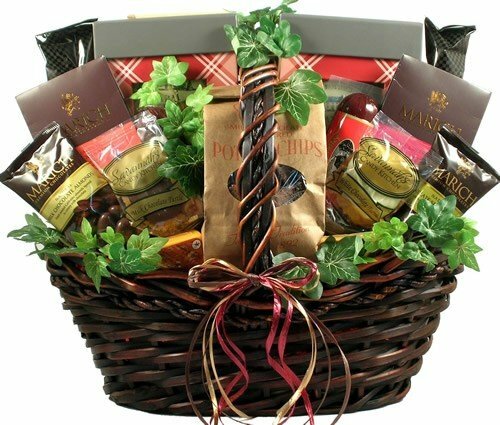 This large, gorgeous gift basket offers a classic design, unique hand-crafted basket and a host of incredibly delicious sweets and snacks. What could be grander? This gift basket includes: milk chocolate smothered grahams milk chocolate smothered potato chips milk chocolate boardwalk crunch gourmet peanut crunch bar gourmet chocolate graham milk chocolate turtle white chocolate turtle chocolate sea salt cashews milk chocolate almonds chocolate cherries and berries triple chocolate toffee chocolate raspberry frosted biscotti white and dark chocolate zebra biscotti old fashioned pecan logs large gift pack with cinnamon pretzels and s'mores chocolate dip large gift pack with dipping pretzels and onion blossom horseradish dip all beef summer sausage with cranberries tomato and basil all beef summer sausage tomato and basil cheese Wisconsin cheddar cheese Tuscan wheat crackers there's enough delicious treats for a group or for one lucky individual. This gift basket will be remembered for a long time to come.